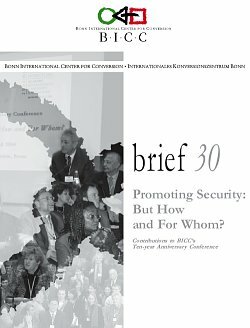 BICC brief 30 documents the international conference “Promoting Security: But How and For Whom?” which took place on from 1 to 2 April 2004 in Bonn and was dedicated to BICC’s 10th anniversary. (6) issues related to small arms control. While it is impossible to summarize the richness of the discussions in a few words, a few themes stood out. One, mentioned in the initial plenary session and in several panels, was the unfinished business of conversion. Many legacies of the Cold War remain, ranging from unfinished arms control matters to unreformed armed forces, or bases which still need to be cleaned up and redeveloped. A second theme was the disheartening prediction, heard repeatedly, that postconflict reconstruction work—and this includes aspects BICC has already focused on, such as disarmament, demobilization and reintegration of former combatants, small arms control, and security sector reform—will become more important in the future. A third thread running through all the panels was the question of what security policy should be about, both today and in the future. Security is a vexing subject, not only for academics but also for political decision-makers. The complexity of defining security emerged from various panels, not only from the panel devoted specifically to discussing the concept of human security. A fourth issue worth mentioning was the critical discussion of the role of military force and the appropriate allocation of scarce resources to military efforts. BICC’s mandate is to try to help find peaceful ways to solve conflicts and minimize the use of military means.